I did not have any personal contact with StayCharlottesville staff for this reservation. It was all done on-line. The property was a 10 minute drive from the University, but what a drive! It was lovely to see some of the beautiful horse farms in the area. Cabell Cottage is just behind the main residence of the owner, but the way the cottage is built, you only see the surrounding woods and have the privacy you want. There is only one full bath, but it is large. The second bathroom is a half-bath on the other side of the cottage, which was fine for our stay. The owners have a wonderful selection of books and we enjoyed a fire on a chilly, Spring night. I am picky about rental properties, but Cabell Cottage was exceptional and exceeded my expectations. 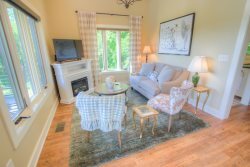 The Cabell Cottage is a beautiful retreat! We enjoyed the privacy and coziness of the cottage as well as its meticulous and thoughtful dcor. We highly recommend this property to anyone seeking a relaxing retreat. Lovely, attractive, beautifully designed and furnished, cottage in private woodsy setting. Convenient to town. Perfect area for long walks. Felt welcome by owners.